This grotesque looking Ambush predator can vary in color to assimilate its surroundings. 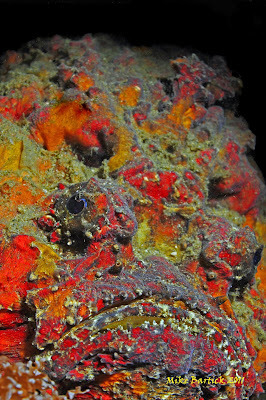 Smaller stonefish are often found dragging along the bottom. These guys are much larger and found primarily on the reef system. This particular specimen was found by my guide Peri. He frantically waved me over pointing into a small cave. At first glance the stonefish appeared to be a sponge until it began to move. I would estimate the size of this Stoney to be the size of a fully grown English Boxer with the looks to match! Night diving in Cebu’s Moalboal can be a hit with Tons of critters that inhabit the shoreline wall. This large Soft Coral Crab is making her home on this soft coral animal. Almost impossible to tell the difference between the two unless scrutinized. 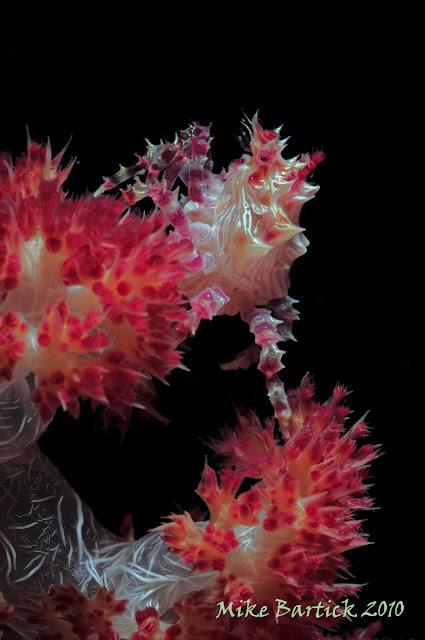 Soft side lighting helped to make the soft coral glow nicely and also helped with the detail on the crab’s carapace. When shooting a subject with this much contrast it helps to underexpose just a tad then to overexpose. The reflective nature of the carapace can be really tough to shoot. 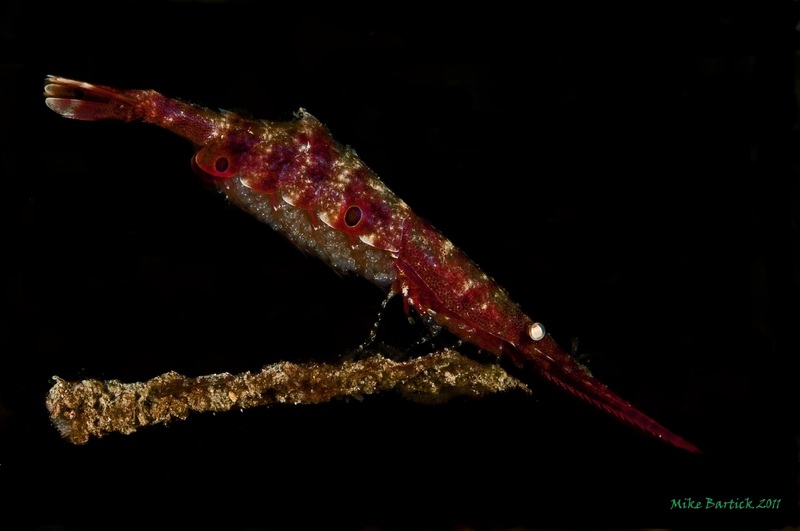 Another gem from Secret Bay, This is a rather large Tozeuma Shrimp that i photographed on a night dive. This was just one of the many different critters we found on this trip that were bearing eggs. Not always an easy subject to photograph. The Tozeuma's dislike bright focus lights and continually turn their heads away. I cover the light with my hand to let him relax a bit, then when he is ready i fire a few pics. 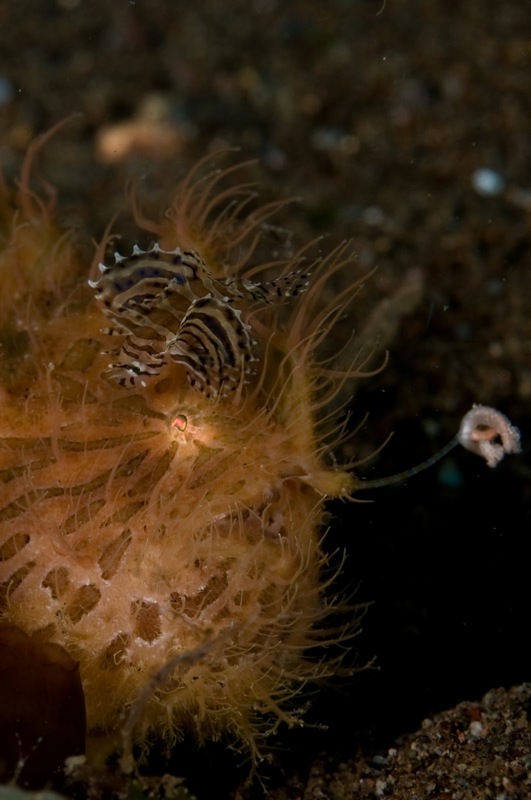 This poor little guy was tormented by this lionfish. He tried with all of his mite not to eat him. He sucked in the Lionfish then spit him out. Secondes later sucked him back in again. 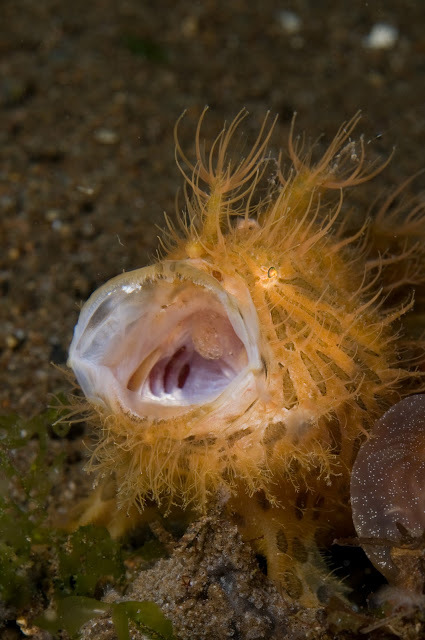 I watched amazed and suddenly, he spit the lionfish out again. Then with a shudder a big yawn as if to say...YOOOOUUUUCCCHHH!!!! The Wunderpuss is truly a rare find. 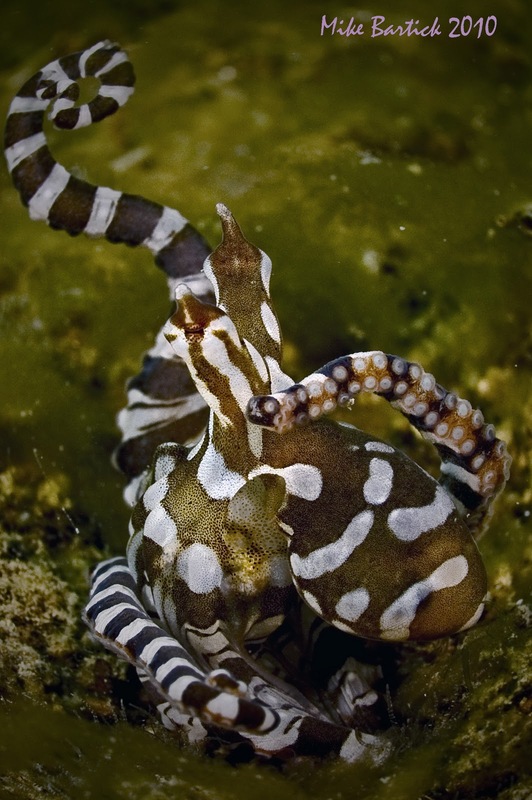 Often mistaken as a Mimic Octopus. Behavior is very much the same in both animals and honestly, it hard to tell the difference without scrutinizing. I found this one in the shallow's of Secret Bay. Getting a good tight composition is often very difficult as the critter is constantly moving erratically and flailing its arms. I shot several frames landscape before going portrait. I tried to capture the fluid movements of this beautiful creature waiting for just the right moment. I spotted him poking its head out from from his hole, looking like a twig as i made my approach. The octo moved into the shallows as i slowly tracked it. As it began to move and dance over the green algae i began to frame and fire.